Chef and television host Pete Evans recently caused a stir when he told Sunday Life that he enjoyed cultured vegetables and activated almonds every day. The backlash on Twitter had people labelling him as elitist and associating "culture" with nights at the opera for broccoli or a good education for carrots and cucumber. In my view, the reaction to Pete's comments shows how little people know about naturally fermented wholefoods. Fermented foods are not new, or novel, or elitist. They are uncooked, cultured, and teeming with health promoting bacteria. They are the foods that many of our grandparents grew up on, for example sauerkraut, kimchi, pickles, beet kvass, and curds and whey. 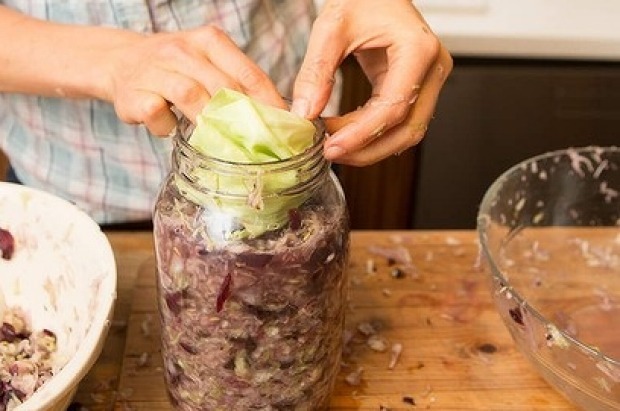 Fermented foods fall squarely in the realm of the home-cook. Their unpredictable nature makes them difficult to sell in a large-scale industrial food system, where homogeneity and predictability are key considerations. Any proud fermenter will have a story or two about a batch of ginger beer that fizzles and pops in a pantry at 2am, or a jar of beet kvass that dribbles dark red beetroot juice across a new kitchen benchtop because it's been too tightly sealed. 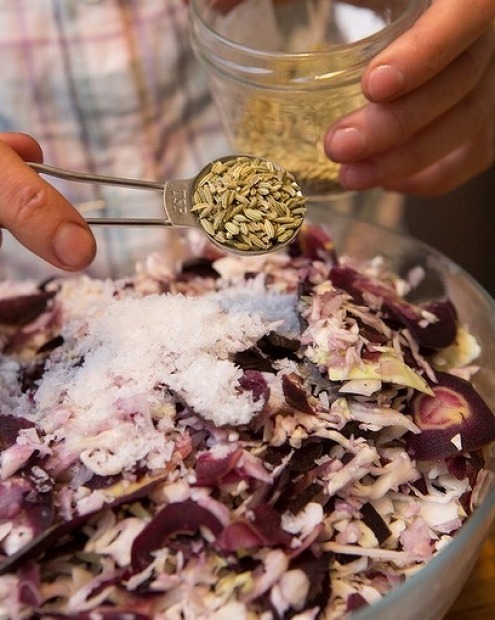 Fermented foods are beautiful, unique and joyously unpredictable. The art of fermentation most likely began as a means to preserve foods throughout the seasons and periods of scarcity. Before refrigeration was possible, food had to naturally sour or ferment to last for longer periods of time. We now know that there are numerous health benefits to eating fermented or cultured foods. When raw food is allowed to culture in an acidic environment, the healthy, acid-loving bacteria such as lactobacillus and bifidobacterium come to dominate. These bacteria are essential to intestinal health; they make nutrients in food more easily available and make the food easier to digest. Many traditional diets included a small condiment of fermented foods or beverage with their meals – it might have been sauerkraut or pickles, or fermented taro root (known as poi), or an unpasteurised jug of beer made from fermented wholegrains or barley. The condiment or beverage provided a fresh, sour tasting addition to any cooked meal, and it also aided digestion and provided unique health benefits. Of course, they also taste delicious. The modern diet predominates in many types of cooked and sterilised foods – dairy products, meat, fish and most vegetables are now predominantly consumed cooked or pasteurised. In stark contrast, fermented foods are live, cultured and rich with healthy bacteria and enzymes. Only a few years ago, the practice of food fermentation was limited to a few small cooking groups (the Cabbage Chuck event in Wisconsin or the Demented Fermenters in Brisbane come to mind) and a handful of older-generation home-cooks. If you were a first-time fermenter, there was a lot of guesswork involved and little support available. Now, there is a booming market of forums, chat-groups, blogs and cookbooks. I have just jumped off a fermenting forum where my online alter ego, bellekraut, had been troubleshooting a jar that turned an odd grey colour. Turns out this was merely a result of the salt that I used and my sauerkraut was perfectly OK. These bacteria are essential to intestinal health; they make nutrients in food more easily available and make the food easier to digest. One of the reasons behind the growth in information on fermentation is that a lot of people are fearful of bacteria and they need reassurance as they develop new skills when they work with it. Fermentation enthusiasts claim that these methods have been used for thousands of years – since the beginning of cooking in fact, so the danger lies in improper preparation and poor food quality. 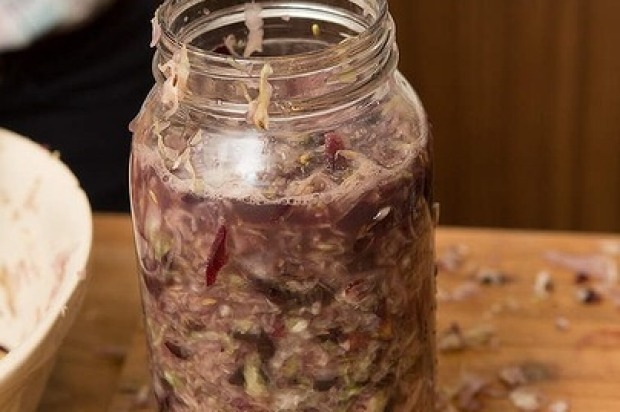 Fermentation guru Sandor Katz, author of Wild Fermentation, claims that just about every food can be fermented, but of course, some are easier than others. 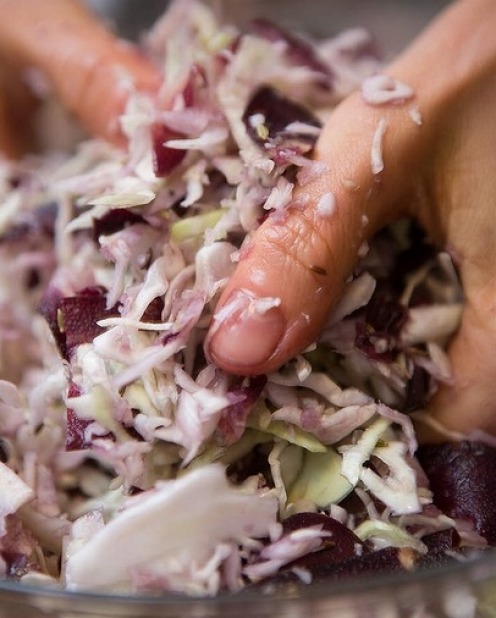 Cabbage appears to have unique qualities that make it well-suited to the fermentation process. It might be the low water content, the high fibre content or the naturally occurring bacteria present on the outside of the leaves. Whatever the case, it is global in its popularity as a fermented food staple. It's used as a base for choucroute in France, sauerkraut in Germany and kimchi throughout Asia. It is an excellent source of fibre, vitamin C and trace minerals, but the key distinctive feature is the live enzymes and healthy bacteria present in the kraut, which aid digestion. * The heirloom variety makes a beautiful purple-coloured kraut. 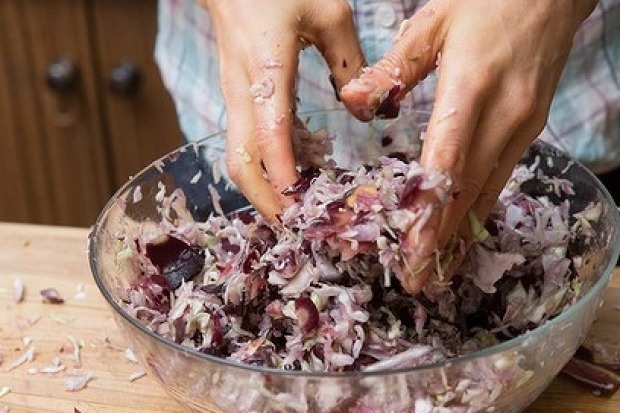 You will be using your hands a lot to make sauerkraut, so it's a good idea to wash them thoroughly and cut your fingernails short. 1. 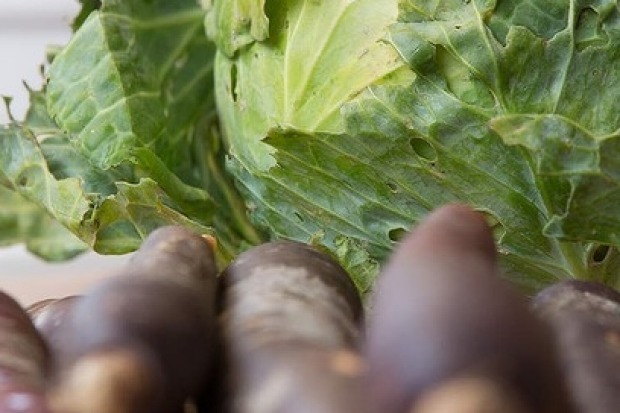 Remove the outer leaves of the cabbage that are tough or covered with dirt. Cut the cabbage into quarters and remove the core. Don't wash the leaves. They have been protected within the cabbage so will not require washing. Set aside 1-2 large leaves that you will use for your sauerkraut "lid" when you have finished. 2. 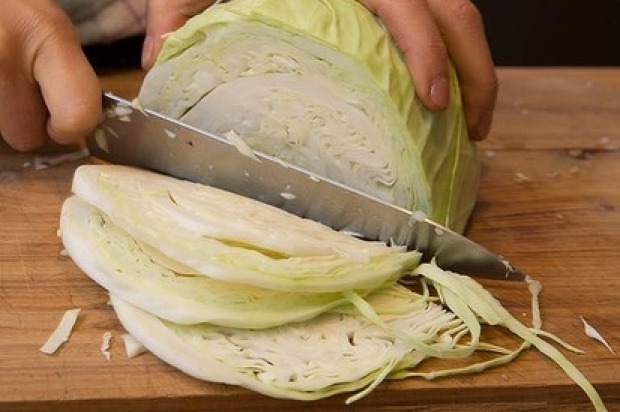 Cut the cabbage into very fine slivers – you can do this with a large, sharp knife or by using a mandolin or food processor. Place in a large bowl and set aside. 3. Remove the carrot tops and rinse the carrots gently – removing any dirt from the skin. Cut carrots into very thin strips or grate using a coarse grater setting. Add them to the cabbage bowl with the salt and herbs. Toss the mixture together thoroughly using your hands. It is really important that the salt is evenly dispersed. 4. Leave the mixture to sit for 10-20 minutes. The salt will draw out the moisture from the vegetables which will provide the liquid required for fermentation. 5. 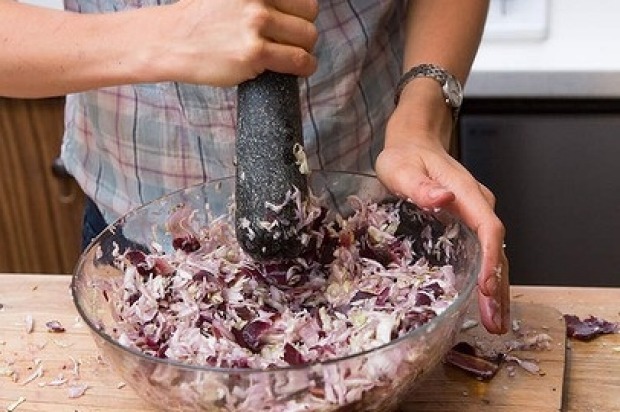 Get your jar or crock ready next to the bowl, then begin to make the kraut. 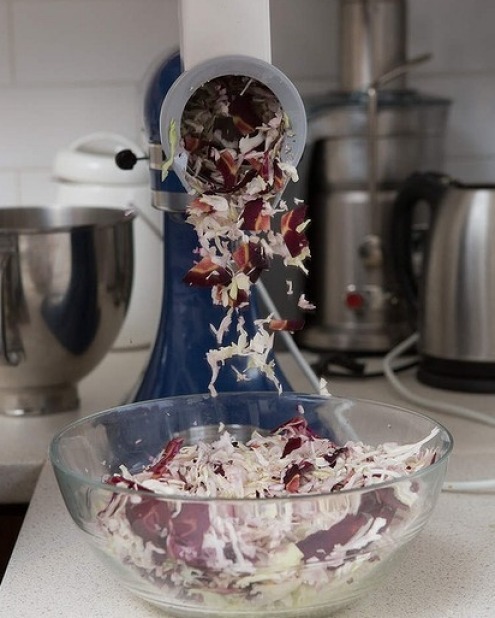 You will need a large pestle, a sauerkraut pounder or a potato masher. Pound the mixture well so that plenty of liquid is released. Place the mixture into the jar or crock and press it down so that the vegetables are completely immersed in the liquid without any air bubbles. 6. Place the leaves that you have set aside at the beginning and use them as a lid over the vegetables. The vegetables should have no contact with air. Use a small weight – it could be a thin jar, or the pestle stick to weigh down the vegetables for the first 24 hours, before removing it and replacing it with the lid. 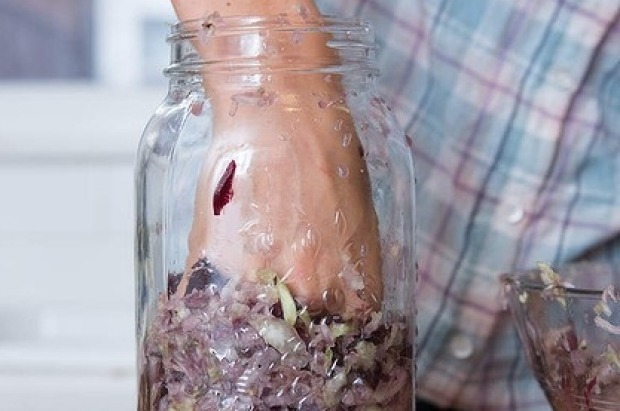 Leave the jar out at room temperature for 36-48 hours before placing it in the fridge. It will be ready to eat within 4 days but will last for several months. Traditionally eaten with cooked meats – roast pork, pork sausages - sauerkraut also goes beautifully in sandwiches with tasty cheese and lettuce. Or, try it in a sandwich with cold roast lamb and chutney. But really, you can eat it with just about anything – in salads, as a condiment, or tossed through with green leafy vegetables for added crunch. Many sauerkraut recipes suggest using a sauerkraut crock. This is a ceramic vessel that is sealed with a weight and can store large quantities of sauerkraut or cultured vegetables. 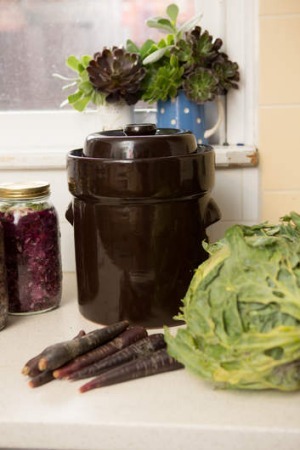 Many fermenters claim that a crock makes it easier to make and store the kraut, however it is a substantial investment (minimum $100.00 spend) if you are a first-time kraut-maker. Wide-mouthed Mason-style jars are an easy alternative. Make sure that they are sterilised before use, and use a minimum size of 1.5L. Also, cover the kraut with a cloth to protect it from light. It is important to use produce that is super fresh and has no chemical sprays on it. Chemical sprays or pesticides can inhibit the good bacteria during the fermentation process. Choose produce that is home-grown or certified as organic or biodynamic. 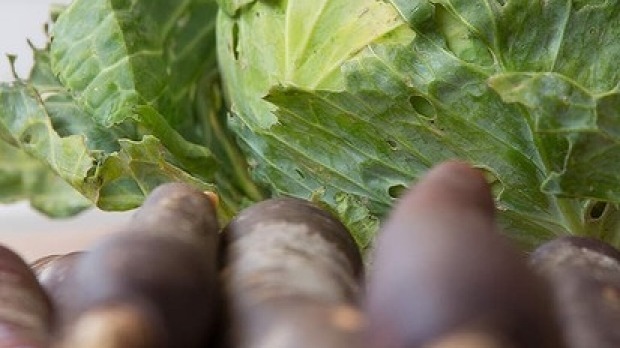 This type of produce will have naturally-occurring bacteria on it – you can often see it as a delicate white powder on cabbage leaves or the outside of fruits and vegetables. This aids in the development of good bacteria during the fermentation process and will result in a better final product. Never choose produce that has been washed or has a waxy finish on the outer skin. This cultured beetroot is superb added to hamburgers and sandwiches. It is sour-tasting and crisp and will fly out of the fridge. 1-2 cabbage leaves to use as a fermentation lid. 1. 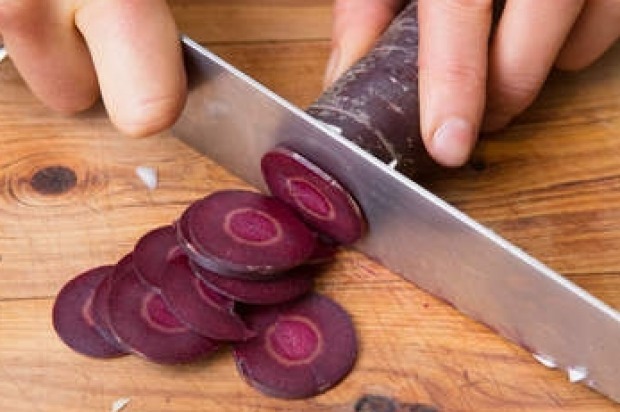 Remove the beetroot skin and slice it into very thin strips or grate using a course grater setting. Add the salt and caraway seeds and mix well using your hands. It is really important that the salt is evenly distributed throughout the beetroot. Leave to rest at room temperature for 15-20 minutes. 2. 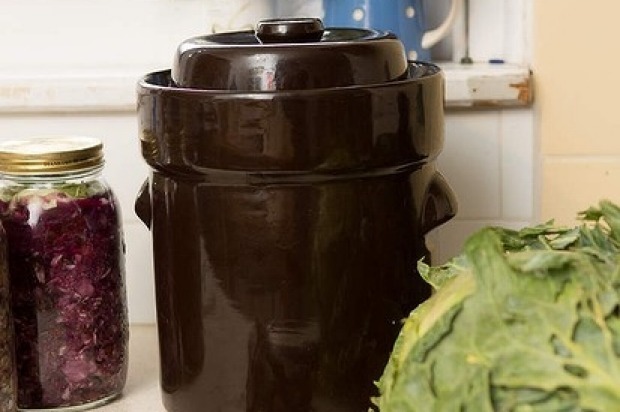 Get your fermentation jars ready next to the bowl and mix the beetroot again using your hands. Squeeze it in handfuls so that the juice is released from the vegetable fibres. Place it in the fermentation jar and squeeze it down so that the beetroot is fully immersed under the liquid. * If you don't have enough liquid, make up a salt brine using 1 tablespoon sea salt to every cup of filtered water and use it to cover the beetroot. 3. Place the cabbage leaves on top to prevent the solids from coming up past the liquid. Make sure it is fully immersed. 4. Leave out at room temperature for 48 hours before sealing it with a lid and transferring to the fridge. Enjoy after four days of fermentation. It will keep for several months. Pickled beetroot is a stellar addition to home-made hamburgers with the usual ingredients such as chutney, tasty cheese, and a fried egg. It also goes well in cold salads with accompaniments such as leftover roast chicken and cold rice. Like sauerkraut, it's great in sandwiches; try it with lettuce and fetta cheese or cold roast pumpkin and witlof.